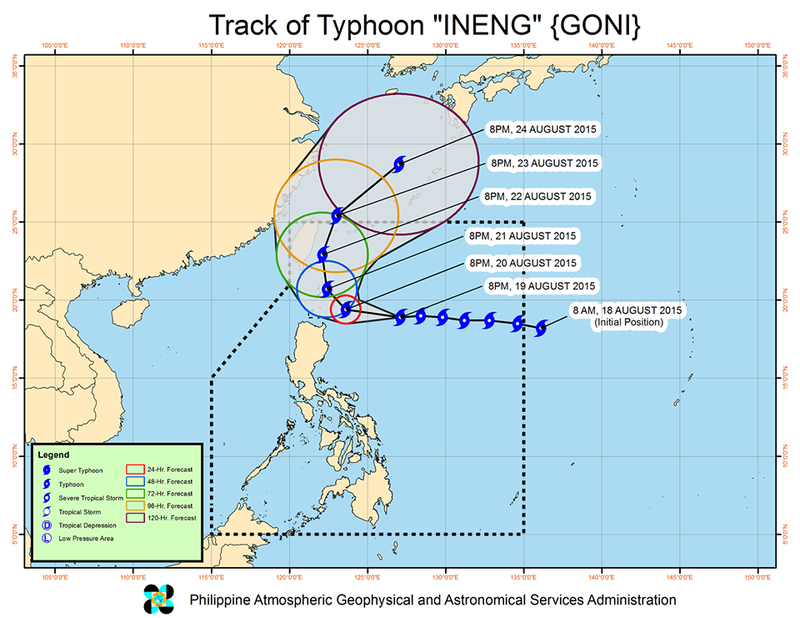 MANILA, Philippines - State weather bureau PAGASA on its 11:00pm weather update on Wednesday, August 19, 2015 said that Typhoon Ineng (international name: Goni) has slowed down and maintained its strength. 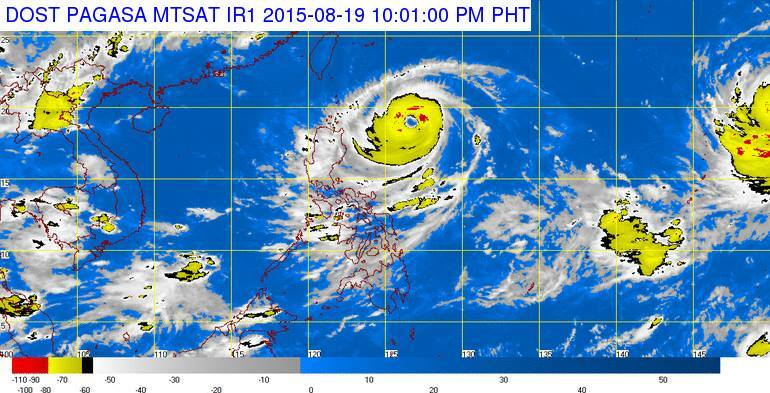 'Bagyong Ineng' is forecast to move West at 15 kph. 24 hour (Tomorrow evening, August 20): 225 km East Northeast of Calayan, Cagayan. 48 hour (Friday evening): In the vicinity of Basco, Batanes. 72 hour (Saturday evening): 270 km North of Basco, Batanes. 96 hour (Sunday evening): (outside Philippine Area of Responsibility, PAR) or at 560 km North Northeast of Basco, Batanes. 120 hour (Monday evening): (outside PAR) or at 1045 km Northeast of Basco, Batanes. Public Storm Warning Signal No. 2 (61-120kph Expected in 24 hrs.) in the following areas: Batanes Group of Islands and Cagayan including Calayan and Babuyan Group of Islands. Public Storm Warning Signal No. 1 (30-60kph Expected in 36 hrs.) was raised over Isabela, Kalinga, Apayao, Abra, Ilocos Norte and Mt. Province. 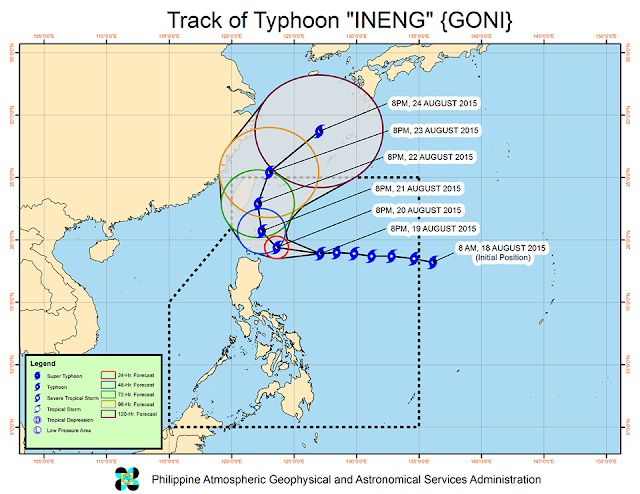 Estimated rainfall amount is from moderate to heavy within the 600 km diameter of the typhoon. Enhanced “Habagat” is currently affecting Palawan and Visayas; Occasional rains over the western section of Luzon including Metro Manila are possible beginning Thursday until early next week. Sea travel is risky over the eastern seaboard of Luzon and seaboards of Northern and Eastern Samar.